Creamy Carrot Soup with Coconut MilkNot only are Pureed Soups pure comfort food, but they're also perfect for anyone on a liquid diet or a pureed/soft food diet. Whether you're recovering from a cold, wisdom tooth extraction or dental surgery, or having trouble swallowing, pureed soups are the perfect medium for making sure you get a nutritious meal even when you're not feeling at your best. Recently, I made some pureed soups for a friend who is fighting cancer. She's a true cancer warrior, holding down a job, while attending school and taking care of her family. I continue to be amazed by her ability to juggle so much while battling cancer. It makes me appreciate all that I have and helps put life in perspective. Often I find myself getting caught up in my own daily challenges, and when I witness the strength and determination of my friends and others who are battling cancer, I am humbled and realize that my daily challenges are nothing in comparison. One of the ways that helps me take the focus off of myself is by cooking for others. My cancer warrior friend is currently on a liquid/pureed food diet which can be tricky day in and day out. Pureed foods can be bland and uninteresting after a few spoonfuls. Eating should be enjoyable, and even when you're on a liquid/pureed food diet, it's possible to prepare a meal to look forward to. My goal was to make soups that contain anti-cancer ingredients and provide nutritious, satisfying, and comforting meals for my friend. 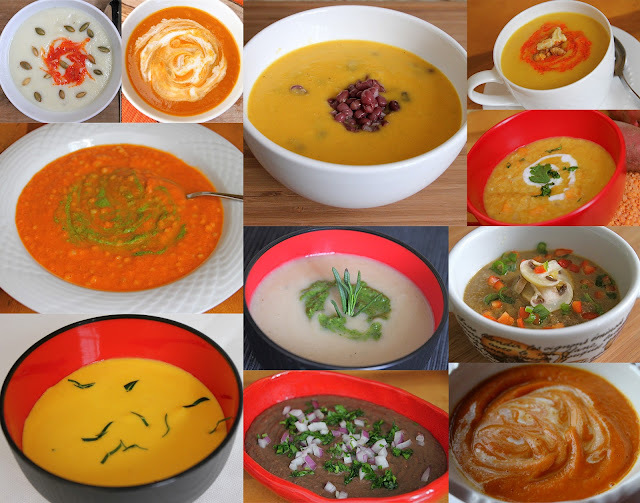 I made a variety, each with a different twist - Curried Cauliflower Potato Soup, Creamy Cannellini Bean Soup, and Creamy Carrot Soup with Coconut Milk. The key to serving an otherwise bland looking soup is to add a touch of color on top. I made some Roasted Red Pepper Sauce and Spinach Pesto to compliment the Curried Cauliflower Potato and Cannellini Bean Soups. The Creamy Carrot Soup was vibrant orange on its own, and the coconut milk and honey add sweetness and a luscious mouth feel without any additional toppings. I hope my friend enjoys these soups and I pray for her complete healing. Put all ingredients into a pot and bring to a boil. Reduce heat and cook on low, covered, for 20 minutes.